Byrd was an outstanding runner, pass receiver, and kick returner in college in addition to his play on defense. 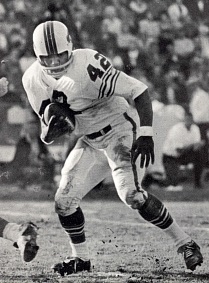 He was chosen by the Bills in the fourth round of the 1964 AFL draft and immediately moved into the starting lineup, intercepting 7 passes, one of which he returned for a touchdown. He received second-team All-AFL honors from the NEA and was chosen to the AFL All-Star Game while the Bills won the AFL Championship. Bills went 10-3-1 to finish first in the AFL Eastern Division while leading the league in interceptions (32) and fewest points allowed (226). Won AFL Championship over San Diego Chargers (23-0). Byrd followed up with another outstanding season in 1966, intercepting six passes, returning one for a touchdown, and averaging 8.1 yards on his 23 punt returns that also included a TD. He played another four years for the Bills and continued to perform at a high level, even as the team’s record dropped off. He was named to two more AFL All-Star Games, was a consensus first-team All-AFL choice in 1969 and a second-team selection in ’68. After starting 143 consecutive games through 1970, he was dealt to Denver just prior to the ’71 season, his last. Overall, Byrd intercepted 40 passes for 666 yards, all with Buffalo and both team records, and returned five of them for touchdowns. He also returned 86 punts for a 7.0 average and one TD, with another score on a punt return in the postseason. Byrd was a consensus All-AFL first-team choice three times and was named to five AFL All-Star Games.